On January 30th, Dr. Dan Whitman's International and Foreign Policy Studies Course spent the day discussing issues in Africa. Students met with former Assistant Director for Africa for USAID and current aide to USAID's Andrew Natsios Kate Almquist, and former U.S. Ambassador to Rwanda, Michael Arietti. On January 23, Dr. Dan Whitman's International and Foreign Policy Studies' students met with with Dr. Mary Phillips, President and Founder of the Asian Scholar Fund. 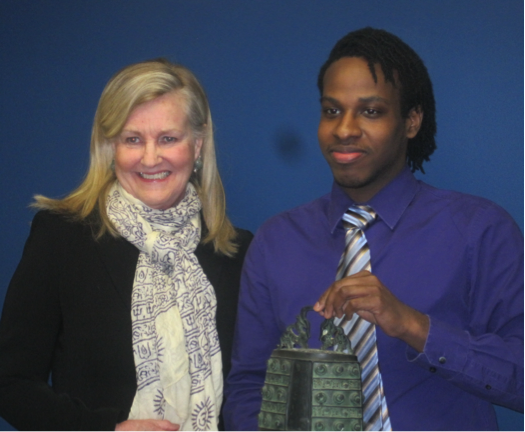 During class, they learned from Dr. Phillips about the relationship between intellectual history and social change in Modern China and students got the opportunity to hold the Chinese Zhou Dynasty Ritual Bell, a symbol of the Chinese Worldview of Confucian Statecraft Ideology.